As a developer, the terminal is a core part of your workflow, along with the Finder and other tools. Jumping from a Finder window to a terminal window in the same directory shouldn’t be hard — in fact, it should be effortless. 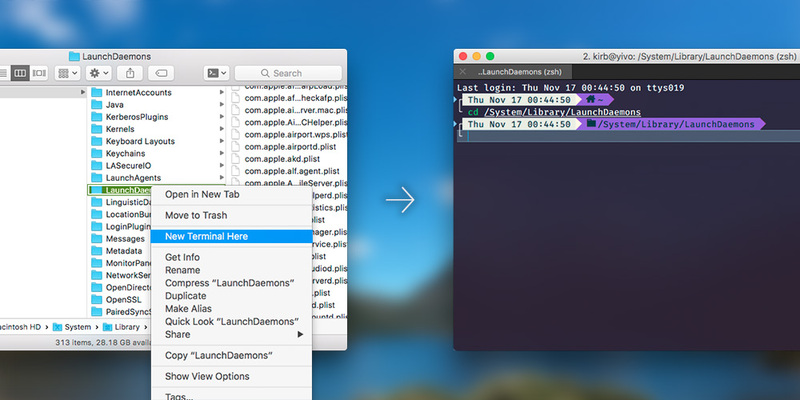 TermHere is a macOS Service and Finder extension that has one job — to place a “New Terminal Here” button in the Finder toolbar and in right-click context menus. Click it, and a new terminal window will open that is immediately switched to the current directory, ready for you to work in immediately. If you select multiple directories, each one will be opened in its own tab. If you select file(s), the directory that contains the file(s) will be used. You can also open a new terminal window from links or paths written in a document, web page, email, and other places supported by macOS’s Services feature. If you don’t use macOS’s built-in Terminal app, you can use the TermHere settings app to select any other app on your computer. Tested to work with Terminal and iTerm2. Cathode and MacTerm do not support being opened by other apps. Supports: macOS 10.10 Yosemite and newer. Due to sandbox restrictions that are problematic for TermHere, we have made the decision to move TermHere out of the Mac App Store. We will be releasing an update on the App Store shortly to prompt users to upgrade to the latest version of TermHere from our website. The app listing will be removed from the App Store shortly following this. Fixes an issue causing TermHere to not work if the app isn’t already open. Adds and updates various translations. The toolbar button now immediately opens a terminal, rather than opening a menu and requiring a second click. Adds options to select between opening a new tab, opening a new window, or reusing the last used tab. Requires Terminal or iTerm 2.9 or newer. * Adds an option to choose between launching each selected item (the new behavior), or the containing directory (the previous behavior). * Adds translations to many languages. On macOS Sierra, apps other than Terminal and iTerm2 currently do not open. We believe this is an issue with macOS and are investigating a workaround. Adds a TermHere service. This means that you can now also invoke a new terminal window from each app’s “Services” menu, and when right-clicking a link or path of a file/folder within a document. Adds a keyboard shortcut — the default is Shift-Command-X. This works everywhere the shortcut does. You can change this via System Preferences » Keyboard » Shortcuts » Services. Adds a setting that allows you to hide TermHere from context (right-click) menus in Finder. Adds support for macOS Yosemite. Fixes an issue causing nothing to happen if the selected terminal app is moved or deleted.